Firstly, your introduction is the most important thing in your survey. Try to think from your users’ perspective. Will you fill out a survey if it says “Please fill out this survey form?” No! of course not. You should tell the purpose of your survey. If it is a customer satisfaction survey, say that it is to get better serving your customers. Secondly, ensure/maximize the user’s feeling of privacy by telling that no one outside your company will see the results of the survey. Additionally, you can use SSL forms to make your form ultra secure and show off the badge to make your users extra comfortable. Last but not least, give clear instructions for using your survey. Tell your users how long it will take. The shorter the better. Minimize the misinterpretations by using sub-headers, form hints, and example fillings. Check out best practices for creating web forms for more info. The worst part of surveys is the validity issue since you cannot be sure who filled out your form and did he/she answer honestly without making up stuff. No worries! We have a partial solution for that which enables a user to fill out a form for only once which will save the limit for your submissions. Check out our unique submission article for a greater insight. Keep the language of your survey as simple and clear as possible: Prepare your survey as if it is directed to a middle schooler. Moreover, if you know your audience very well, write on their level. Keep your questions short: Long questions bore users and increase the exit rate of your survey. Use short and clear questions, no more no less. Don’t create a 1000 question survey to get every response out there: The way to create a short survey is by using necessary questions only. Another method is by decreasing the size of your survey and creating the illusion of shortness. Think about it. You open a survey and look at the scroll bar on the right which is tiny. Would you go all the way down? You’ll shout “NO WAY!”. Put some page breaks which will help your users the feeling of accomplishment in each button push. Don’t confuse the user: One question should only respond to one idea. “How do you feel about oranges when you think about apples?” wouldn’t be a good question after all. Don’t use leading questions: Some questions prepared in a leading manner could result your users to fill out the expected answer and lead to dishonest behaviour. Use a non-territorial question. “Many people find this situation... cruel. How do you feel about this?” Seems very influential and proves that the surveyor is manipulative like he/she is trying to impress the boss. Use subjective terms that would help the user: Don’t use terms like often, as it may vary from person to person. Thinking in numbers, “often” can be 10 times a day for one person and 50 for another. Be careful when using terms like that. Include all of the possible answers: Don’t forget to include options such as “don’t know”, “no idea”, “haven’t heard that” etc. If you don’t give your user a choice of all the possible answers, you’re user will likely choose a false answer which will lead you to have false data. Don’t get too personal: Think about the general audience not yourself. Some questions might offend your users and increase the exit rate of your survey. Try to be as neutral as you can with your questions. Check the users for accuracy with attached questions: Some users may fill out your survey form randomly. To prevent randomly filled forms, pinch a few questions that mean the same but put in different words. That will help you validate who is carefully filling out your survey. Test Your Survey Form: Find some people to test before making it online. Send it to your friends, family, colleagues etc. Get feedback for it. Ask about the introduction of your survey. Was it explanatory? Was it hard to understand? Was it interesting? and so on. 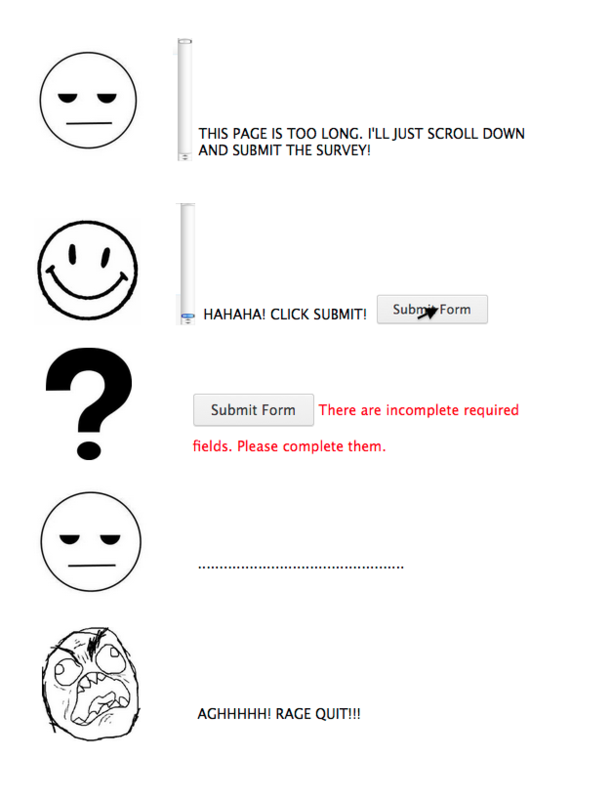 If possible, try to get how they felt in certain areas of the survey form. This may help you prevent the weird or personal questions and refine them before taking it online. Additionally, look at how our choices have been set. They cover the scale of happiness in all the ways possible because we don’t want to leave out gaps between answers. You don’t have to do 7 or 9 pairs of answers like us but having large gaps between answers may confuse your users. The likert-type intensity questions will help you scale answers and even help you calculate test and quiz scores but we will get into that in another article. What are you trying to prove with this survey? If you haven't read part 1 here's an easy link for that. We hope this article was educational for you. We would very much like to know your thoughts about creating surveys. Did you follow similar steps or just created surveys randomly? Let us know your techniques. cannot figure out how to reduce size of the text area so for is not as long. Survey Form on Hold and reactivate ? What does the account settings counter on the left mean?